This Veterans Day, 1871’s Yun Tai -- an Army veteran -- takes a look at the intersection of the veteran and tech communities. In this post, he’ll reflect on why veterans are natural born innovators, excel at entrepreneurship, and continue to serve their communities even after they’ve left the military. Every veteran has a number of highlights from their career in the military. Flying in a C-130 with a parachute, reserve, weapon, and over 80 pounds of equipment strapped to their body is not one of them. The word ‘uncomfortable’ takes on a new meaning. But soon, that word is replaced by another one -- “‘tense.’ That’s what happens when the amber light turns on and the Jumpmaster gives the order to stand up. Each soldier yells the order back so that everyone can hear. 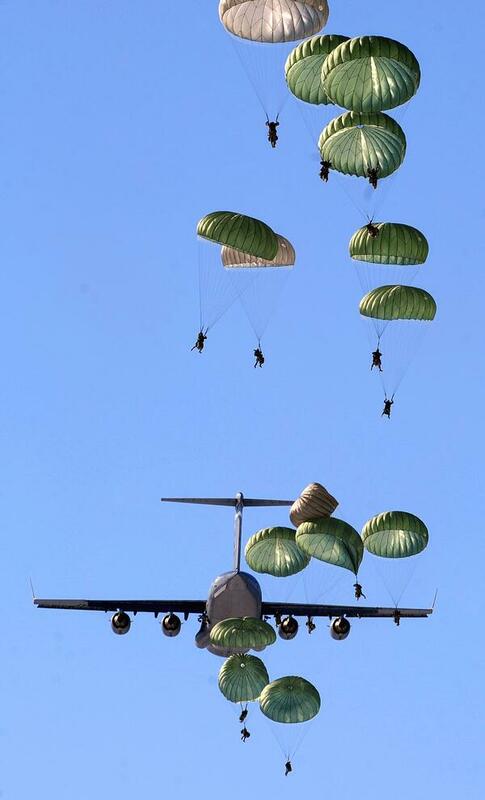 Soon, the Jumpmaster follows that order with “hook up!” You hook up your static line, which will eventually open your parachute, and do a quick mental check to make sure everything is where it’s supposed to be. And then, the green light comes on. Before you know you it, it’s your turn to leap out the door. For the briefest of moments, you wonder, ‘why am I jumping out of a perfectly good plane?’ And then you jump -- count to four -- and watch as your parachute opens as you glide to the ground. Next? You pack up your ‘chute, head to the rally point, and get ready to do it all again the next day. And though you may have jumped dozens of times, the anxiety never disappears. You accept the fact that, to do what you love, you’re going to be uncomfortable, tense, and anxious -- it’s just part of the job. Having sat down with many members of Chicago’s tech and entrepreneur community, those very same words come up over and over again. In fact, I don’t think I’ve met a single founder who wasn’t uncomfortable, tense, or anxious; as many of them will attest, that’s just part of building a business. It’s just one of many similarities that veterans and entrepreneurs share. In fact, outside of the gear they carry and the uniforms they wear, founders and veterans often have many of the same attributes. Leadership? Check. A willingness to take risks? Check. Cohesion and teamwork? Check. Long hours? Check. Self-reliance and discipline? Check -- I could go on and on, but suffice to say that our servicemembers have acquired many of the same skills that make for a good entrepreneur. One thing that’s certain about entrepreneurship is that it can be a very tough road, and though the destination may have been different, many veterans have already walked down that path. However, more than anything, veterans are expert innovators. As the old Teddy Roosevelt quote goes, you ‘do what you can, with what you have, where you are.’ From duct tape to GPS, many of today’s greatest inventions came from servicemembers who had to solve a problem with limited budget and resources. While many recognize well-established names such as Elon Musk or Sheryl Sandberg as modern day innovators, I often think of a Special Forces Communications Sergeant I once knew who made a working antenna out of sticks and a few wires he picked up at the hardware store. In addition to their innovative perspectives, many veterans are also committed to service. From charity events to disaster relief, organizations such as Team Red White and Blue and The Mission Continues are staffed with veterans who volunteer their time and services to help advance community initiatives. For many veterans, a sense of purpose and service will always exist -- and I’m always inspired when I run into veterans in Chicago who volunteer to help youth organizations, charities, and nonprofits in any way they can. Because of their focus on community, entrepreneurial attributes, and innovative thinking, it’s no surprise that veterans have -- and will continue to -- play a key role in cementing Chicago’s reputation as a leader in tech and business. On this Veterans Day, both myself and 1871 are proud to honor and recognize those of you who served. You are, and always will be, our nation’s greatest asset. Thank you for your service, your sacrifice, and our continued freedom. Here are number of companies that support veterans and their families in Chicago. If you or someone you know is a local veteran, make sure to check them out. Bunker Labs: An 1871 tenant and partner, Bunker Labs is a 501(c)(3) non-profit and national network of veteran entrepreneurs, located in more than 20 cities, dedicated to helping new veteran entrepreneurs start their own business. They are committed to seeing that every entrepreneur in the veteran community has the network, tools, and resources they need to start their own business. The Pat Tillman Foundation: An 1871 tenant, The Pat Tillman Foundation unites and empowers remarkable military veterans and spouses as the next generation of public and private sector leaders committed to service beyond self. Through the Tillman Scholars program, they are building the leading fellowship program for military veterans and spouses. Founded in 2008, the program supports active-duty service members, veterans and their spouses with academic scholarships, a national network, and professional development opportunities, so they are empowered to make an impact at home and around the world. The Tillman Scholars are already making a difference in the fields of medicine, law, business, technology, education, the arts and more. Yun Tai is an Army veteran who served in Operation Iraqi Freedom.